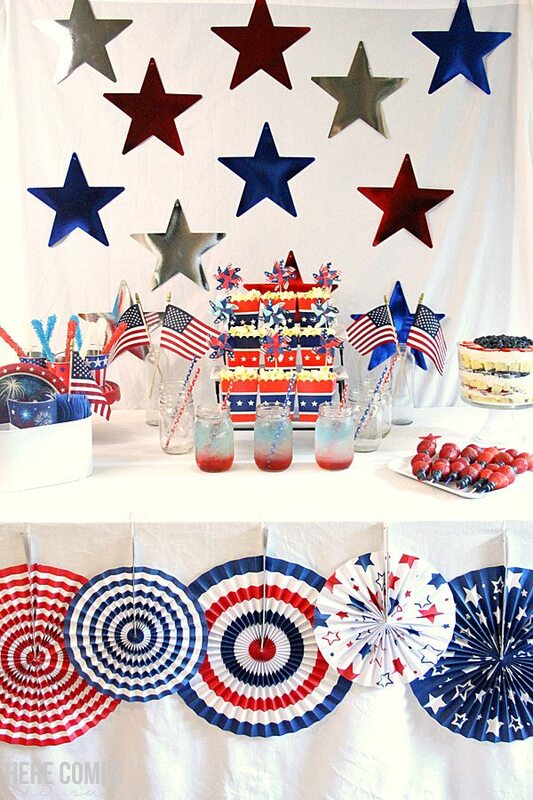 Thank you to Oriental Trading Company for sponsoring this July 4th Party Ideas post. Does putting together a party turn you into a nervous wreck? It doesn’t have to be so stressful, trust me. 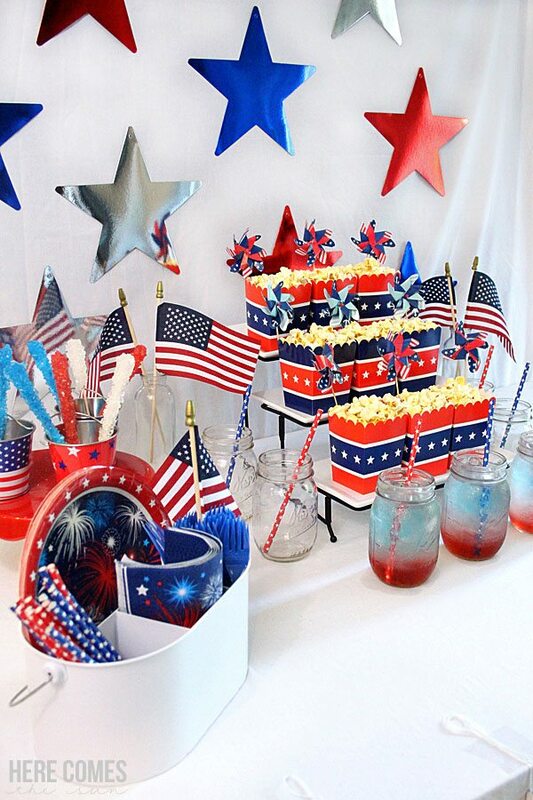 You’re going to love these July 4th party ideas and I want to show you how easy it is to put together this party with supplies from Oriental trading company. I am a total sucker for the red white and blue color scheme. I may look forward to this time of year more than Christmas. I think it’s because I just love summer and all the celebrations that come with it. There is so much to celebrate; the end of the school year, the start of summer break, and of course, our Independence. Whenever I put together a party, I focus mainly on the food table. First, I cover the table and hang a backdrop. For this party, I used white sheets but you can use anything really. If you have heavy tablecloths, they would work nicely too. Sheets tend to have lots of wrinkles in the (at least mine do) and it is difficult to iron them out and get them looking crisp. I tend to stay away from the cheap plastic tablecloths just because you can’t get the creases out of them but that’s just my Type A coming through. Use whatever is easiest for you. 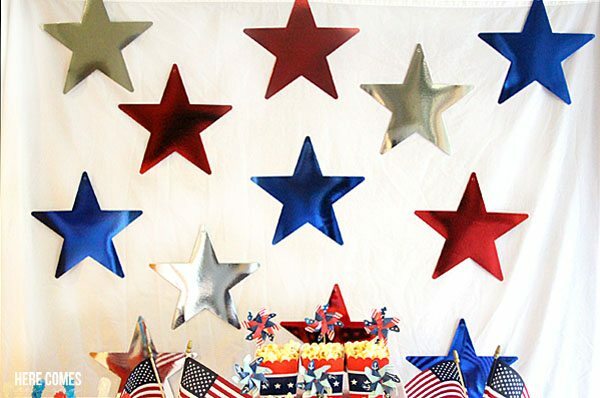 Next, I decorated the backdrop with Patriotic Stars. I simply attached them to the sheet with some clear packing tape. A couple minutes and you have an instant show stopping backdrop. These stars held up all day without a single one coming loose. So you don’t have to worry about a star going rogue or anything like that. I also love to decorate with paper fans. They come in all sizes, colors and patterns and really make a big statement. 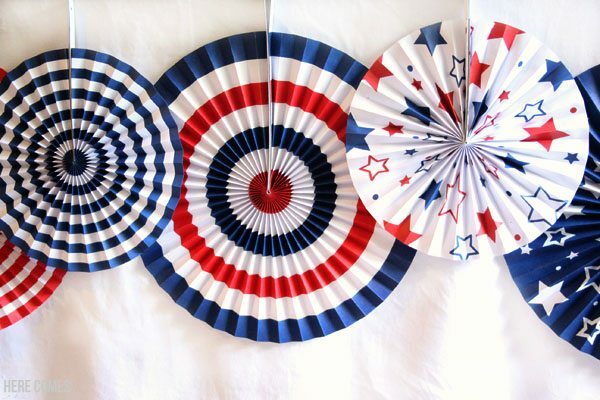 For my July 4th party, I chose the Patriotic Hanging fans and taped them to the top of the table so they hung down in front. I really love how the bright colors pop against the white background. The fans are also great at hiding some of those pesky wrinkles that you can’t get out of the tablecloth. 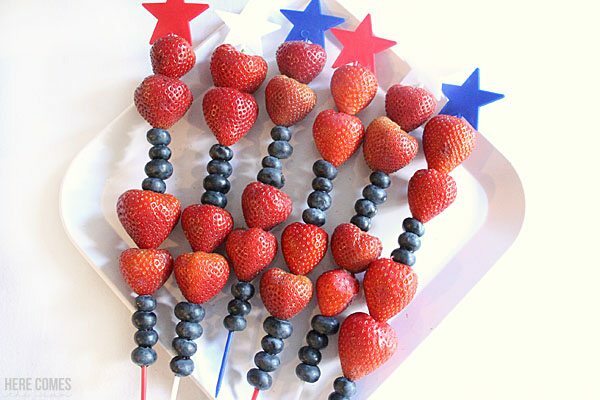 When it comes the party food, I like things that are grab in go like these strawberry and blueberry fruit skewers made with Patriotic Fruit Kabob Sticks and popcorn served in Patriotic Popcorn Boxes. For added decoration I used Shining Sea Pinwheel Picks in the popcorn boxes. A July 4th celebration isn’t complete without fireworks and flags. 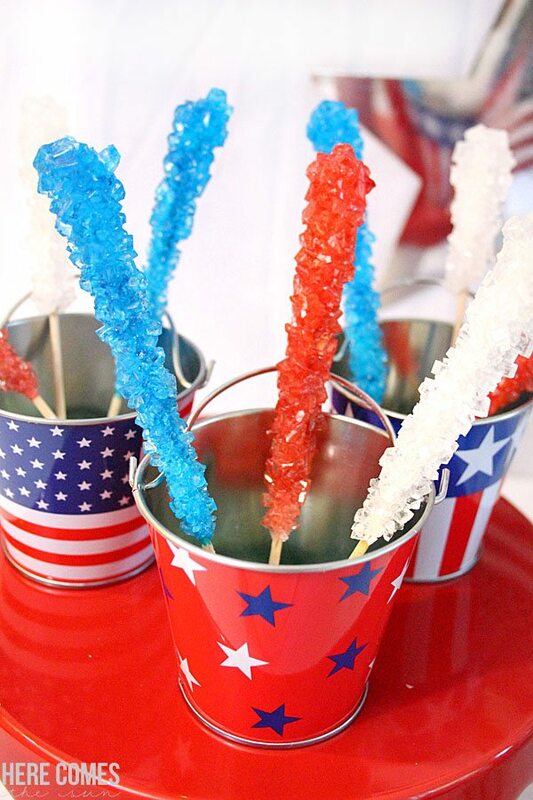 These Patriotic Sugar Rock Candy Pops reminded me of fireworks so I knew I had to include it in my party. I placed the candy into these adorable Patriotic Tin Pails. And for the flags, I just placed a few in some empty bottles on either side of the table. Did you see my tutorial on how to make a red white and blue layered drink? If not, be sure to check it out so you can add some festive drinks to the party. You’ll be surprised how easy it is to make them. Your guests and your kids will think you’re the coolest ever when you come out with a tray of these. 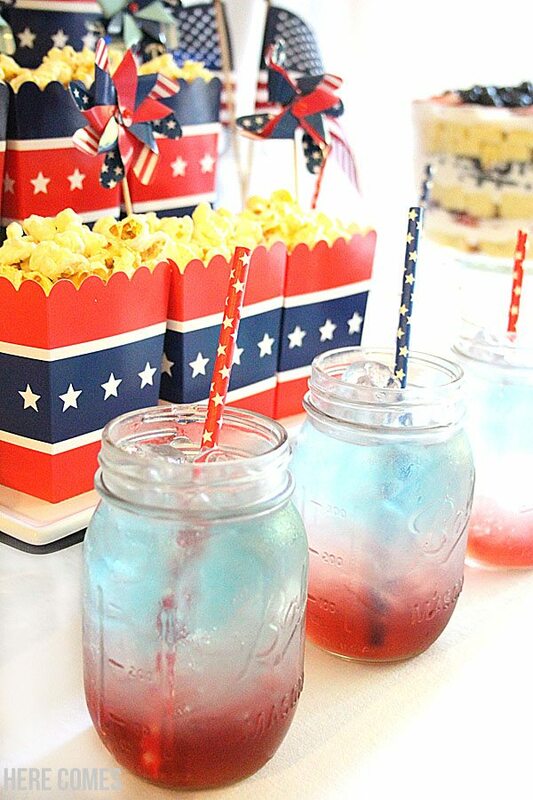 Add some Patriotic Paper Straws to your drinks for some extra pizzaz. And yes, the colors stay separate for a decent amount of time. 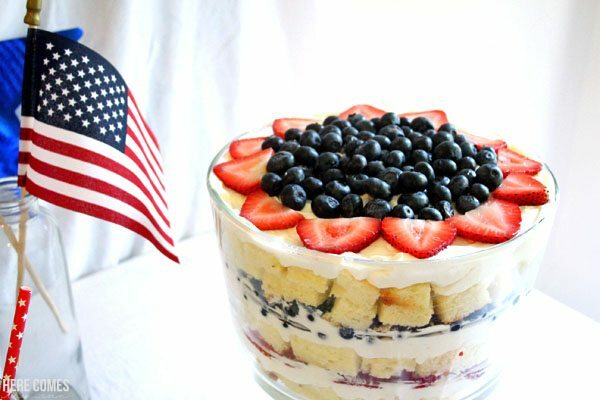 For dessert, I went all out and made this Berry Trifle. This clearly breaks my grab n go rule but it was just too pretty not to include. And tasty too. It was hard keeping little hands off this while I took these photos. And who can blame them? It is so delicious! And did I mention it is no-bake? I will hopefully have the recipe up on the blog soon. Just because the trifle isn’t grab n go doesn’t mean it can’t be enjoyed. 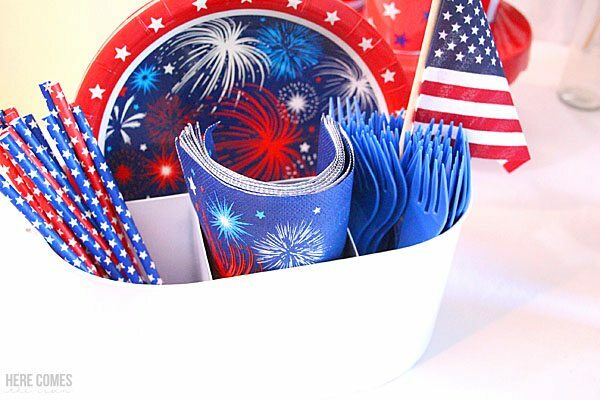 It looks great on these Patriotic Burst Dinner Plates. 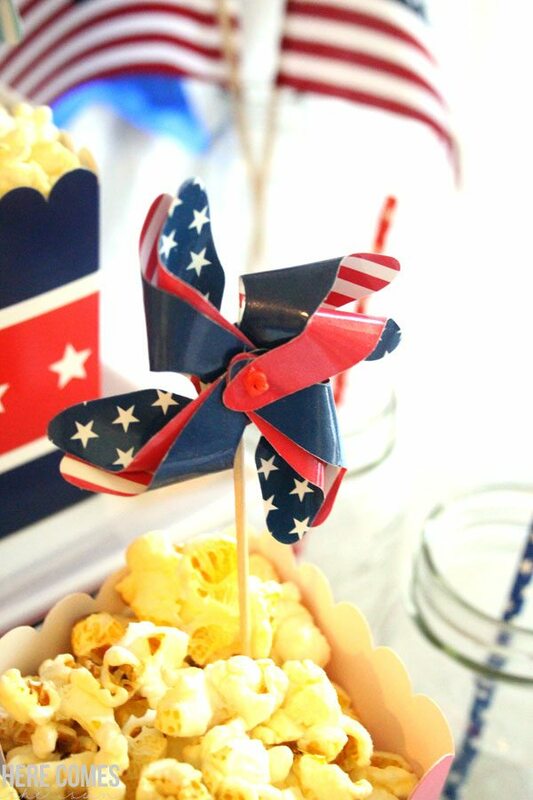 So do you think you can put together a gathering with these amazing July 4th party ideas? You can do it! Look how amazing this party is with a few simple supplies. Make sure to pin this so you don’t forget! 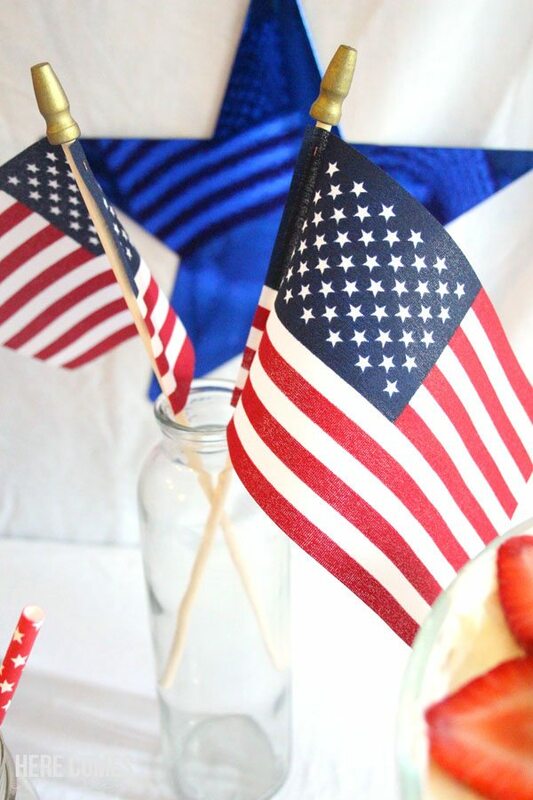 For more July 4th party ideas make sure to check out my Patriotic wreath, July 4th Party Garland, Patriotic Wooden Sign and No drip jello popsicles. « 20 Popsicle Recipes to Beat the Summer Heat!